It’s not easy for Konnie Kuiper to decide which of his dozens of antique cars and transportation treasures rank at the top of his list of favorite four-wheelers. But among his first picks is a 1939 LaSalle hearse, carefully preserved and stored in his Northwest Indiana private museum. “The year 1939 is also the year I was born, which makes this hearse extra special to me,” said Kuiper, whose hobby for collecting cars, carriages, sleighs and assorted vintage modes of transportation began at age 16. Kuiper’s familiar name has been associated with funeral homes in Northwest Indiana since 1957. After decades of serving families at Kuiper Funeral Home in Highland, which opened in 1969, Kuiper partnered with colleague Kevin Nordyke in 2017 to launch the family-owned Hillside Funeral Home & Cremation Center at 8941 Kleinman Road in Highland. “We cannot change a difficult time, but we are committed to make a difference helping families during a difficult time,” said Kuiper, a graduate of Worsham College of Mortuary Science. Kuiper’s wife of 52 years, Karen, and the couple’s children, Laura and Julie, and four grandchildren all share the family pride showcasing and preserving transportation from yesteryear. In July, Kuiper provided a horse-drawn hearse from 1890 to be one of the highlights in Highland’s Fourth of July parade. Sometimes, he also allows his vintage automobiles to be incorporated into the funeral arrangement requests of families, such as providing use of his 1959 Packard hearse. However, he has never allowed any of his displayed fleet, which includes a horse-drawn fire engine, vintage restored touring sedans and prized sports cars, to be used by movie production companies. “I want to make sure everything I have is treated with care,” Kuiper said. Kuiper also does not publicly disclose the location of his museum space, nor discuss prices and the value of his collection, with the exception of providing one key clue he has encountered during the decades. Kuiper said his private car museum is primarily used for family functions and events such as company parties associated with his own employees. It’s a business bonus his partner Nordyke has enjoyed as a witness to the wheeled wonders during the two decades he’s worked with Kuiper. “It’s interesting to see how Konnie’s collection has changed over the years,” Nordyke said. Some keepsakes he retains because of the memories and sentiment attached, he said. 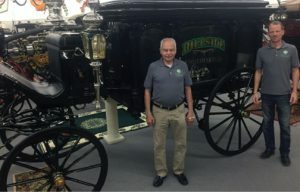 Kuiper, hailed as an authority in both the mortuary field and his collecting interest, attends car sales and auctions around the country, with some of the highlights the international auto events each spring and fall hosted by RM Sotheby’s in Auburn. Kuiper’s other interests include three decades serving on the school boards for the Town of Highland, Highland Christian School and Illiana Christian High School.